Here we have several more marquetry enquiries that we thought you may find of interest. The marquetry items displayed on this page mainly consist of pictures that , although they are of very high quality, are not documented in our archives. If you can help us with some information on who created any of these works and any other relevant information regarding their history, would you be so kind as to contact us by clicking the link to the right of the pictures. Thanks for your help. December's update see's us with a magnificent amount of further information on the Buchschmid & Gretaux inlay pictures which has been provided courtesy of our very good friend Terry Fout. 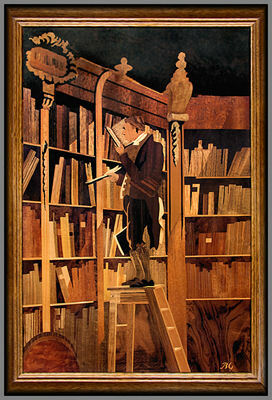 Terry sent us this superb copy of one of his own Buchschmid & Gretaux pictures entitled "Book Worm". The veneer selection in this picture seems to be very well chosen with some beautifully figured Walnut in evidence. Even a nice quilted effect can be detected from a close study of the library chair's veneer. 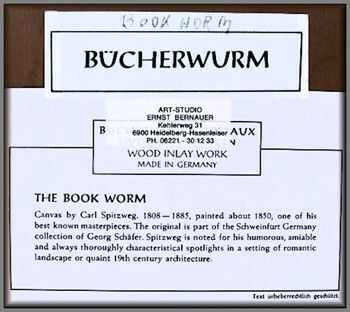 As well as the Book Worm picture, Terry also unearthed a goodly quantity of Buchschmid & Gretaux's very own descriptive text describing their work methods, veneer selections and product / title list. It is interesting to note that, as well as their pictures, Buchschmid & Gretaux also produced wood inlay work on trays, tables and wall plaques. You will note from reading Buchschmid & Gretaux's description of their working methods that their jig saw style of "wood inlay" produces a sort of "jig-saw puzzle" assembly procedure whereby each jig sawn piece fits correctly into a vacant corresponding slot in the main work piece. This "jig saw" method differs somewhat to today's Window method whereby the insert veneer in the Window method is cut directly from the utilization of the vacant slot (or window) itself rather than from a remote blueprint drawing. Both methods have their respective merits and it is up to the marquetarian themselves which method they prefer. We rather wonder what Messrs Buchschmid & Gretaux would have made of laser marquetry. It is certainly a process that would have endeared itself to them - it would have saved those tracing paper and blueprint stages, and, it would have ensured almost total accuracy into the bargain. We feel sure it would have appealed to them! The wording in this text on the right is Buchschmid & Gretaux's own description of their working methods. From their description it would seem to be the correct assumption that they were producing their work by the fret or piercing saw methods as we described earlier on page 2 of these enquiries. Wood inlay work is a fine art handicraft of medieval origin. It brings into effect the wonderful variety that the thousands of different kinds of wood all over the world show in hues and grains. It is done with veneers, which is the trade term for very thin sheets of wood. These are obtained by slicing up the very best trunks of the desired wood in specialized plants. Burls, knots and roots show the finest and most vivid grain structure. and is a trade mark for the highest standard of workmanship available. Every item thus signed is guaranteed to be perfect in every way, and, in design and execution, to be a product of that firm. The owners had divided the corresponding tasks among themselves, Mr. Grétaux, was the artist, creating the design, and Mr. Buchschmid, is the artisan, controlling the execution. The following description explains to you the process of making an inlay picture. The process for tables and trays is very much the same. After carefully scrutinizing the possibilities of a scenery for the specific requirements of inlay work Mr. Grétaux first designs the contours of the picture on transparent paper, in lines only, without shadows. Blueprints of this drawing are then cut apart into all the pieces which later in the finished product will show the different wood colors. Each one of these pieces of blueprint is then pasted onto a selected piece of the right veneer taking care of desired grain direction, and on a jig saw cut to the exact shape according to the confining lines on the blueprint. 10 to 25 different veneers and 120 to 300 pieces in all are used for one picture. With tables the amount of pieces could be up to 1,000. After cutting these pieces are assembled by glueing them onto a piece of paper in the reverse scene of the intended picture. Both this paper and adhering pieces of veneer are turned upside down and the veneer side, under heat and pressure, glued onto a basis plate with precisely uniform thickness, while simultaneously a compenstation veneer is glued onto the backside, thus forming the visible reverse side. After this glueing process the paper layer that shows now on top is carefully sanded away. Under it there appears the reverse picture in the reverse sense, i. e. same as the original drawing. The wood of the veneer is then sealed off against environmental influences in a way that the wood pores still show, and with them an inimitable feature of genuine wood. For tables a slightly different procedure completely seals the surface against attacks of spilt alcohol and other liquid, here the pores disappear under the finish, but the silklike impression of the pictures surface in maintained. Then the picture is framed, isolated against humidity seeping in and there is the finished product. Everything is handwork of the highest skill, all materials are of the very best quality available, all colors are natural wood shades with occasional sand burns for rounding effects. There are different pictures and tables in production. Some of the veneers mentioned in the Buchschmid & Gretaux "list of veneers" may seem very odd and unusual. As an example, Dosey Walnut is a name that doesn't appear in any of the common veneer lists - another one is Withwood - this is probably a veneer that was locally available to Buchschmid & Gretaux but is not seen outside of their locale. It is also quite probable that many of those strangely named veneers have become unobtainable due to conservancy constraints. They may also have been "local names" rather than the more familiar generic terminology we are more used to. If we can find the "common names" for those veneers we will bring them to you in another update of these pages. / 20.00” x 51.00” Plate. The art of inlay work rests on very few eyes or hands. It will always remain impossible to mass produce. Inlay work is conserved and cleaned like ordinary polished furniture. Do not put them right over your radiator, insulate the pictures by underlaid pieces of cork sheet if your walls are very humid. Try to conserve a minimum amount of air humidity in centrally heated rooms by hanging water containers onto the radiators. Click the above button to return to page 3 of "Can You Help"
Click the above button to visit page 5 of "Can You Help"